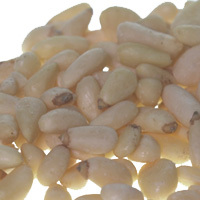 Occurrence: Pine nuts can be eaten raw, especially in salads and an essential ingredient in Pesto, or as an added ingredient in many savoury and sweet recipes. Allergy Information: Allergy to pine nuts has been reported less frequently than allergy to tree nuts and pine is botanically only distantly related to other food plants. Thus pine nuts are not currently listed in annex IIIa of the EU directive on labelling of pre-packaged foods. Severe reactions including anaphylactic shock have been reported but few of the patients who were suspected to have reacted to pine nuts recalled eating pine nuts. This is possibly because these nuts are used for flavouring and are thus often hidden ingredients. Some tree nut or peanut allergic individuals may react to pine nuts. Note that pines are only very distantly related to tree nuts such as walnut and that amongst the seed plants, pine is botanically one of the most distantly related to other food plants. Añó et al. (2002)  report anaphylaxis in a 10 year old. They also review 22 previous published cases of pine nut allergy with symptoms of anaphylaxis (13/22) including one anaphylactic shock, urticaria (7/22), angioedema (3/22) and gastrointestinal symptoms (1/22). Ibanez et al (2003)  report additional cases of anaphylaxis in a 23-month-old girl and a 15 year old girl. van de Scheur & Bruynzeel (2004)  reported a patient with generalized urticaria, swelling of the face, and dyspnea after eating a mixed salad containing pine nuts. On a prick-prick test with pine nut there was a strong local skin reaction, acute dyspnea, angioedema, and circulatory collapse within minutes. Food/Type of allergen:Añó et al. (2002)  describe how prick by prick tests have been most commonly used with pine nuts. However, several studies have used extracts. The method of Garcia-Menaya et al. (2000)  prepared pine nut extracts by grinding nuts and extracting 1g meal with 9ml of phosphate buffered saline for 1h at room temperature with shaking. Following centrifugation at 10,000xg supernatants were removed and stored at -20C. Extracts were used for skin prick tests and CAP. Protocol: (controls, definition of positive etc)Saline was used as a control and 10mg/ml histamine as a positive control. Reactions were considered positive which gave a wheal diameter 3mm greater than the control (Garcia-Menaya et al. 2000 ). Summary of Results:Añó et al. (2002)  review publications on 22 patients and report positive SPT on almost all (2 rub tests were reported). One SPT was negative using extract but positive on prick-prick testing (Roux et al. 1998 ). Wheal diameters varied from 4 mm to 74 mm. Similarly, Ibanez et al. (2003)  report that SPT with pine pollen extract was negative but a prick-by-prick test with a pine nut was positive with a wheal of 12 x 16 mm in the first case, and 9 x 17 mm in the second case. van de Scheur & Bruynzeel (2004)  reported a single prick-prick test leading to acute anaphylaxis and recommend the use of standardised extracts. IgE protocol:RAST, ELISA and CAP. Positive CAP or RAST results were reported or reviewed for 15 patients (Añó et al. 2002)  and for 2 patients (Ibanez et al., 2003)  . De las Marinas et al. (1998)  separated pine nut allergens with 1D SDS-PAGE using a 12% acrylamide separating gel. Garcia-Menaya et al. (2000)  separated pine nut allergens with 1D SDS-PAGE using a 18% acrylamide separating and a 4% stacking gel. The extracts were diluted 1:1 v/v in either nonreducing sample buffer or one containing 5% v/v 2-mercaptoethanol. Immunoblotting detection method:De las Marinas et al. (1998)  transfered proteins onto a nitrocellulose membrane in a Bio-Rad transfer tray at 200 V and 0.8 mA/cm for 1 hour. The membrane was blocked for 2 hours with 1% (w/v) BSA in phosphate buffered saline, PBS, at pH 6.8, washed and incubated with sera for 20 hours. After 4 washes, it was incubated with 1/50 (v/v) diluted peroxidase-conjugated goat anti-human IgE. Bands were stained with 0.06% (w/v) 4-chloro-1-naphtol in PBS with 0.01% hydrogen peroxide. Garcia-Menaya et al. (2000)  transferred proteins by a diffusion method or by the method of Towbin et al. (1979)  to nitrocellulose sheets which were incubated overnight with 10 ml of 1/20 dilution of serum from the patient in buffer. After three washes, the membranes were incubated for 3h with a 1:1000 (v/v) dilution of monoclonal anti-IgE antibody (Ingenasa, Madrid, Spain). After washing, the membranes were incubated for 1h with a 1:2000 (v/v) dilution of anti-IgG labeled with alkaline phosphatase (Bio Source International, Camarillo, CA, USA). After new washes, IgE binding was revealed by adding nitroblue tetrazolium/5-bromo 4-chloro 3-indolyl phosphate (Amresco, Solon, OH, USA). Koepke et al. (1990)  reported 3 IgE binding bands running at 66-68 kDa. De las Marinas et al. (1998)  reported several IgE binding polypeptides including a prominent 50 kDa band. The IgE binding was inhibited by almond extract. Senna et al (2000)  reported IgE binding to polypeptides running at 14-16, 25, 32, 35, 46, 55 and 67 kDa. The IgE binding to the 35-67 kDa bands from pine pollen extract could be inhibited by pine nut extract. Garcia-Menaya et al. (2000)  found IgE binding to a 17 kDa polypeptide which disappeared on reduction. Añó et al. (2002)  found IgE binding to polypeptides running at 30 kDa and 44 kDa. This could be inhibited by peanut extract but not almond extract. Ibanez et al (2003)  found double IgE binding bands at 17 kDa with weak IgE binding to a band at 37 kDa band with one serum and strong IgE binding to a 50 kDa band with the other serum. There was no IgE cross-reactivity to pine pollen or other nuts. Food used and oral provocation vehicle:Nielsen et al (1990)  gave two pine nuts. Beyer et al. (1998)  gave a teaspoonful of pine nuts. Rubira et al. (1998)  gave a single pine nut. Nielsen et al (1990)  , Armentia et al. (1990) , Rubira et al. (1998)  and Beyer et al. (1998)  report positive oral challenges of single patients. Symptoms:Nielsen et al (1990)  reported urticaria of the underlip and hypersecretion after one minute, followed by oedema of the palatine arches (10 mg. of loratadine was given). The patient developed nausea after 10 minutes and 1 mg of clemastin was given IV. After 1 hour, the pulse dropped from 84 to 60 and the patient vomited. The symptoms subsided gradually and the patient was able to leave hospital next day. Rubira et al. (1998)  reported the symptoms as immediate nausea and vomiting. Beyer et al. (1998)  reported the symptoms as marked conjunctival inflamation, periorbital reddening and itching. IgE cross reactivity to pine pollen (Senna et al 2000 ), almond (De las Marinas et al. 1998 ) and peanut (Añó et al. 2002 ) has been found by immunoblot inhibition. The patient of De las Marinas et al. 1998 ) was also allergic to almond but tolerated walnut, hazelnut and peanut. 1/4 patient of Rubira et al. (1998)  showed reaction to many foods with walnut weaker than squid or prawn. It is interesting that very few of the patients recalled eating pine nuts. Senna et al (2000)  suggest that this is because these nuts are used for flavouring and are often hidden ingredients. Añó MA, Maselli JP, Sanz ML, Fernández-Benítez M.
Koepke JW, Williams PB, Osa SR, Dolen WK, Selner JC. de las Marinas D, Vila L, Sanz ML. Armentia A, Quintero A, Fernandez-Garcia A, Salvador J, Martin-Santos JM. Allergy to pine pollen and pinon nuts: a review of three cases. Systemic allergic reaction to pine nuts. Beyer AV, Gall H, Peter RU. Ibanez MD, Lombardero M, San Ireneo MM, Munoz MC. Roux N, Hogendijk S, Hauser C.
Severe anaphylaxis to pine nuts. Rubira N, Botey J, Eseverri JL, Marin A. Allergy to pine nuts in children. Senna G, Roncarolo D, Dama A, Mistrello G.
Anaphylaxis to pine nuts and immunological cross-reactivity with pine pollen proteins. van de Scheur MR, Bruynzeel DP. Acute anaphylaxis after pine nut skin testing. Towbin H, Staehelin T, Gordon J.